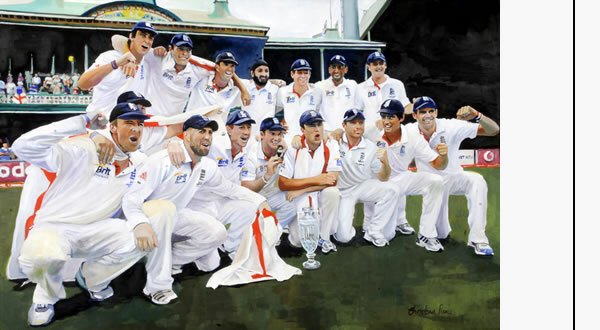 Painting for auction at Ian Bell's Benefit dinner at the Dorchester Hotel, London, 9th June. See home page for bookings. 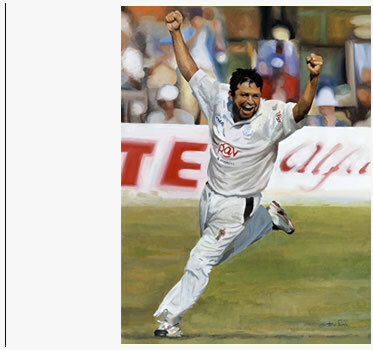 Mushy, international Pakistani cricketer, specialised as a leg spin bowler. 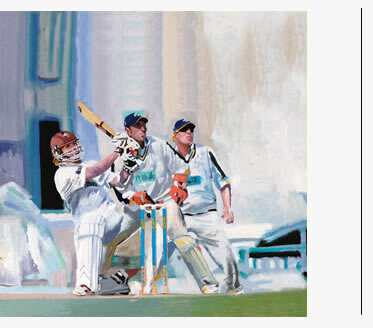 He played county cricket for Somerset and Surrey and more recently for Sussex where he became the county’s leading wicket taker for 4 seasons in a row and helped them win the County Championship in 2006 and 2007. Currently Mushy is the spin bowling coach for the England Cricket Team. Jonathan Batty made his debut for Surrey back in 1997, and went on to become an integral part of the side that dominated the domestic game through the late 90s and early 2000s. 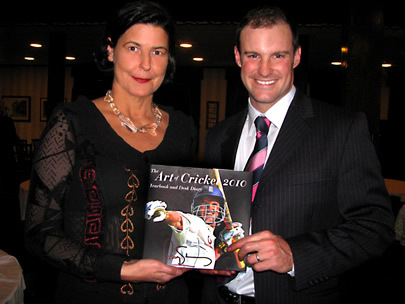 At the start of the 2009 season, JB had amassed 514 first class dismissals and 732 dismissals in all cricket. Along with 18 first class centuries, which places him 10th on the all time list of wicketkeeping century makers in first class cricket, you can see why many people feel that he’s been extremely unlucky not to have earned international honours yet. Recognised by colleagues as the epitome of a team man, JB was appointed club captain for the 2004 season. 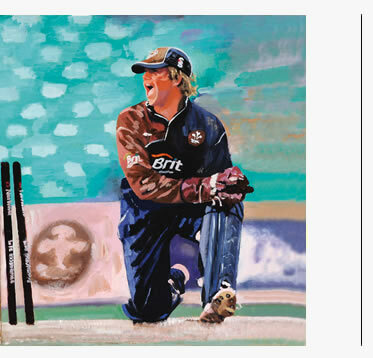 This followed on from the honour of being named BBC London cricketer of the year for 2003. Over 50 caps and 2000 runs for England sit atop a First Class career stretching back over 18 years, with a batting average of nearly 48. Technically very correct, John Crawley is recognized the world over as one of the best on-side players in the game. John Crawley's star studded career began in 1989 and he was the first to score 1,000 runs in U19 ‘tests’. He made his debut for Lancashire CCC in 1990 and after a record breaking career with the Red Rose county moved to Hampshire in 2002. Creepy made his full test debut in 1994, topped the English First Class batting averages in 1998 and went on to achieve 37 England caps. 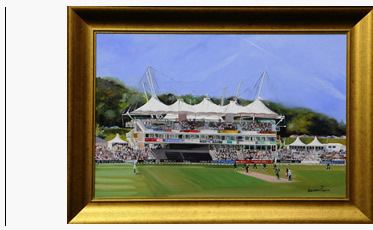 Two large original oil paintings by Christina Pierce of the Rose Bowl, Hampshire’s county ground, are available for sale in aid of Creepy’s Benefit Year with a percentage donated to his charity ‘THE MULTIPLE SCLEROSIS SOCIETY’ www.mssociety.org.uk. For details contact Christina Pierce. 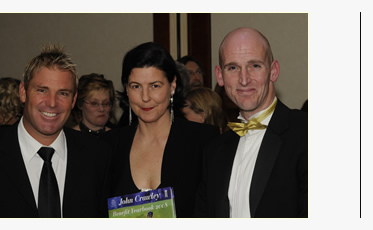 Christina designed and produced THE JOHN CRAWLEY BENEFIT YEARBOOK 2008 which includes Creepy’s benefit events, achievements, stats, autobiography and Hampshire fixtures as well as oil paintings, desk diary, details of the 18 major counties and international fixtures. 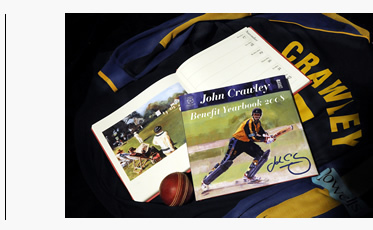 To obtain the John Crawley Benefit Yearbook contact the Benefit Office on 01256325 803 or email admin@johncrawley2008.com. 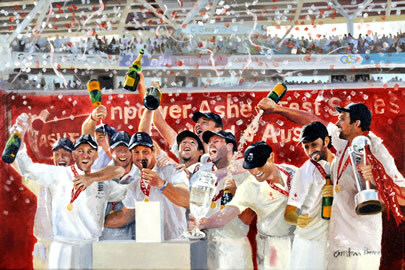 Also available are a variety of prints, some signed by the Hampshire team, for sale and auction. 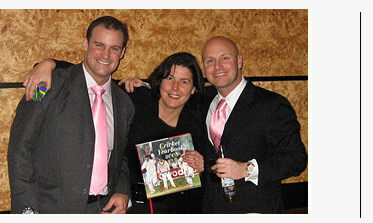 To Christina Pierce for all her dedicated hard work in putting together the Yearbook and for all her artwork – Chrissy you’re a star and without you and Nick we would never have seen such a fantastic collectable as the Yearbook. David Nash, wicket keeper for the Middlesex CCC side for the past 10 years achieved international honours representing the England U19 side. 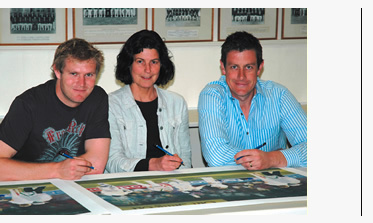 Nashy played in twelve U19 tests in 1995/6 and was a member of the England A side that toured Sri Lanka in 1997/8. He boasts a First Class batting average of 33.72 and over 300 dismissals for Middlesex. 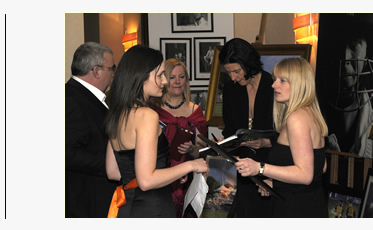 A selection of Christina Pierce’s prints were auctioned in aid of his benefit year with a percentage donated to his charity ‘THE SHOOTING STAR’ children’s hospice. Ashley played for Warwickshire CCC where made his debut in 1993. 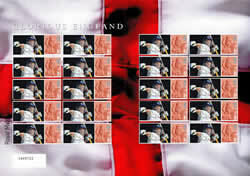 He played 54 Tests and 62 One day Internationals for England before being forced to retire due to injury. He found his cricketing feet on Ripley village green (Surrey) and was coached by Brian Ruby at Guildford Cricket Club. 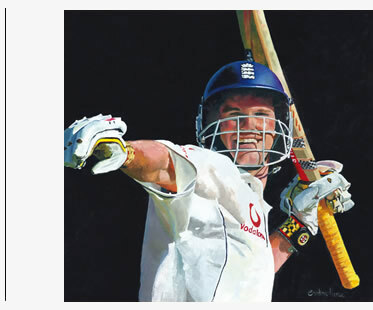 In 2005 he became a national hero as a member of the Ashes winning squad which with bat and ball tipped the balance of cricket power in England’s favour against the previously all conquering Aussies. To make the sweet smell of success even more potent Giles and the rest of the squad have been immortalized by artist Christina Pierce. 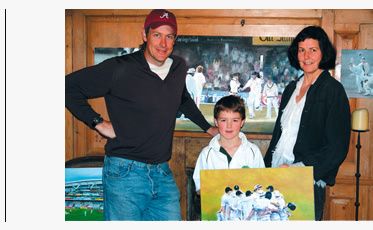 The usually cool, modest Giles was quick to put his hand in his pocket when he heard that one of Christina’s works was a recreation of arguably his finest hour, the thrilling moment when he smacked the winning runs at Trent Bridge to put England 2-1up in the series. 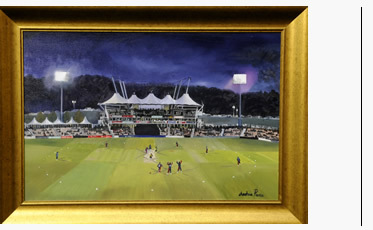 Giles also purchased an artists study of on-pitch bonding in which the England team is locked into one of its regular huddles before start of play. 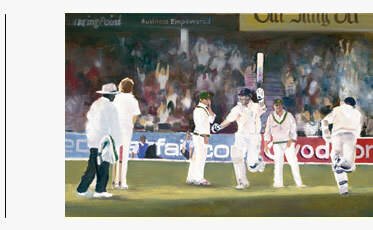 Christina produced 129 limited edition prints signed by Ashley Giles and Matthew Hoggard entitled TWO TO WIN which depict the winning moment at Trent Bridge. 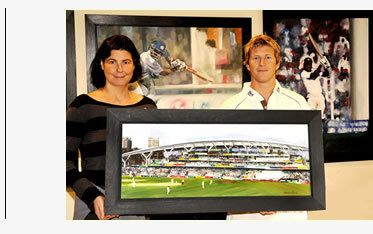 These were auctioned for his Benefit Year in aid of LEUKEMIA. Some are still available through Christina Pierce. Joe joined Wasps at 16 in 1993, he made his first team debut two years later and has been a mainstay of the side ever since. Joe has figured prominently in the last three World Cup squads and who will forget his amazing ‘tap tackle’ in the thrilling semi final against France in Paris captured on canvas by and being auctioned in aid of his testimonial by Christina Pierce. "TAP TACKLE" Joe Worsley. England v France World Cup 2007. 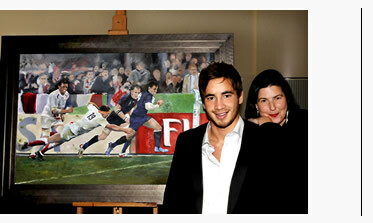 Danny Cipriani at Twickenham Testimonial dinner.